Another one for you car lovers! 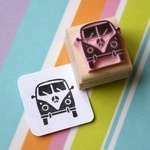 In addition to my vehicle range comes this rubber stamp inspired by the iconic VW Bug, perfect gift for the retro car lover in your life! The stamped image measure approx. 2.5cm x 2.3 cm (or 1 "” x 7/8”).